“What strength the soul draws from prayer! In the midst of a storm, how sweet is the calm it finds in the heart of Jesus. But what comfort is there for those who do not pray?” These words, written by Mother Théodore Guérin after surviving a violent storm at sea, perhaps best exemplify her life and ministry. Truly, Mother Theodore drew strength from prayer, from conversations with God, with Jesus and with the Blessed Virgin Mary. Throughout her life, she encouraged prayer as she sought to share the love of God with people everywhere. 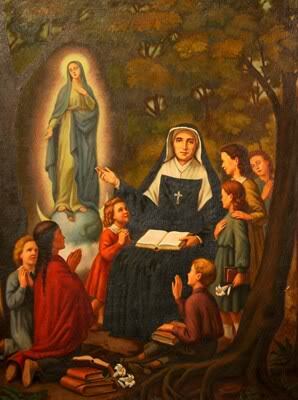 Mother THÉODORE—ANNE-THÉRÈSE GUÉRIN—was born Oct. 2, 1798, in the village of Etables, France. Her devotion to God and to the Roman Catholic Church began when she was a young child. She was allowed to receive her First Communion at the age of 10 and, at that time, told the parish priest that someday she would be a nun.